How much teenagers must borrow for college often depends on whether their parents can help foot the bill – and how much they can afford. 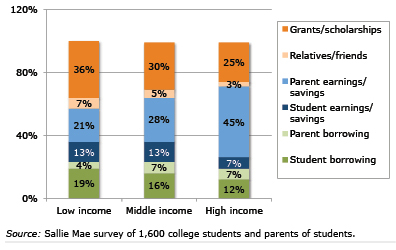 Fresh data from a survey by Sallie Mae, the private college lender, shed light on how low-, middle- and high-income families find the money to pay for a college education. The data break down how much of students’ total costs – tuition, plus books, room and board, fees, living expenses, and transportation – come from earnings, savings, borrowing, grants or other sources. Celebrated scholar Jared Diamond doesn’t mince words in exploring “the low status of the elderly in the United States” in the above Ted video. His sobering lecture on the elderly ends on a positive note as he describes their gifts – wisdom, knowledge of history, and skills refined over decades – and how society might better use them. But the neglect, isolation, and abandonment of the elderly, or worse, he explains, are not new. They were present in some early traditional societies that could not care for them or would not spare the resources to do so. The isolation of older Americans today, Diamond believes, is a direct consequence of the changes that have come to define modern societies: the elderly’s complete separation from the labor force in retirement, the geographic dispersion of families and friends, and technology. Young people in the noon yoga classes here at Boston College bend, twist, or flatten themselves more easily than their much older classmates. But older people are better savers – 50-year-olds save at more than double the rate of 40-year-olds – and perhaps yoga can explain how this happens. In yoga, one doesn’t immediately balance into Warrior III without toppling over or find the upper-body strength for the Crow pose shown above. It takes practice to build the balance, strength, focus, or flexibility that each pose requires. Only with time do these pretzel-like configurations become less painful and more convincing. Poorly executed poses, practiced and repeatedly improved, are the only path to perfection.